Answer: Yes, the company can file a declaration under Chapter VI of the Act. The Directors of the company shall not be liable for any offence under the Income-tax Act, Wealth-tax Act, FEMA, Companies Act and the Customs Act in respect of declaration made in the name of the company. Question No.3: Whether immunity in respect of declaration made under the scheme is provided in respect of Acts other than those mentioned in section 67 of the Act? Question No.7: As per section 71(d)(i), declaration cannot be made where an undisclosed asset has been acquired during any previous year relevant to an assessment year for which a notice under section 142, 143(2), 148, 153A or 153C of the Income-tax Act has been issued. If the notice has been issued but not served on the declarant then how will he come to know whether the notice has been issued? Answer: In the case where proceedings are pending before an Assessing Officer in pursuance of a notice under section 142, 143(2), 148, 153A or 153C of the Income-tax Act served on or before 30-06-2015, the declarant may declare the undisclosed asset under Chapter VI of the Act. However, while computing the amount of declaration the investment made in the asset during the previous year relevant to the assessment year for which such notice is issued needs to be deducted from the fair market value of the asset for which the person shall provide a computation alongwith the declaration. Further, such investment which is deducted from the fair market value shall be assessable in the assessment of the relevant assessment year pending under the Income-tax Act and the person shall inform the Assessing Officer the investment made during the relevant year in such asset. Also to clarify, where a notice under section 142, 143(2), 148, 153A or 153C of the Income-tax Act is issued on or after 30-06-2015, the declarant shall be eligible to declare full value of asset even if such asset (or part of such asset) is acquired in the previous year relevant to the assessment year for which such notice is issued. Question No.11: Where a search/ survey operation was conducted and the assessment has been completed but the undisclosed foreign asset was not taxed, then whether such asset can be declared under Chapter VI of the Act? Exchange of Information (AEOI) route under FATCA from USA later in the year 2015. Further, under the multilateral agreement India will start receiving information from other countries under AEOI route from 2017 onwards. As at 18th March 2015, 58 jurisdictions (including India) have committed to share information under AEOI by 2017 and 36 jurisdictions have committed to share by 2018, including jurisdictions which have beneficial tax regime. The multilateral agreement is expected to cover all the countries in the near future. The information under the AEOI will include information of controlling persons (beneficial owners) of the asset. The possibility of discovery of an undisclosed asset may arise at any time in the future; say for example, information of an immovable property can be unearthed if any utility bills/property tax or even gardener’s/caretaker’s salary has been paid through an existing or closed bank account. Therefore, if any information of an undisclosed foreign asset acquired earlier, say in the year 1975, for $ 100,000 comes to the notice of an Assessing Officer later, say in the year 2020, when its value becomes, say, $ 5 Million, the liability under the Act amounting to 120 percent of the fair market value of the asset on the valuation date may arise in the year 2020, besides prosecution and other consequences. In this case if the valuation date is in the year 2020 the amount of tax and penalty under the Act will be $ 6 Million. Question No.15: If a declaration of undisclosed foreign asset is made under Chapter VI of the Act and the same was found ineligible due to the reason that Government had prior information under DTAA then will the person be liable for consequences under the Act? Answer: In respect of such assets which have been duly declared in good faith under the tax compliance but not found eligible, he shall not be hit by section 72(c) of the Act and no action lies in respect of such assets under the Act. However, such information may be used for the purpose of the Income-tax Act. 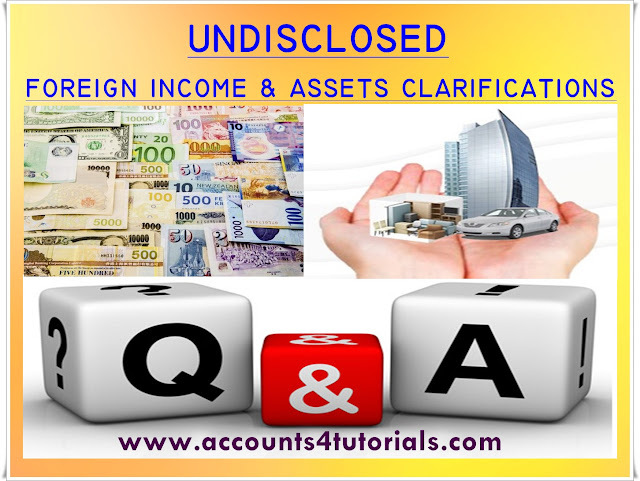 Answer: Since, these assets are fully explained they are not treated as undisclosed foreign assets and should not be declared under Chapter VI of the Act. However, if these assets are not reported in Schedule FA of the Income-tax Return for assessment year 2016-17 (relating to previous year 2015-16) or any subsequent assessment year by a person, being a resident (other than not ordinarily resident), then he shall be liable for penalty of Rs. 10 lakhs under section 43 of the Act. The penalty is, however, not applicable in respect of an asset being one or more foreign bank accounts having an aggregate balance not exceeding an amount equivalent to Rs. 5 lakhs at any time during the previous year. Question No.19: A person has a foreign bank account in which undisclosed income has been deposited over several years. He has spent the money in the account over these years and now it has a balance of only $500. Does he need to pay tax on this $500 under the declaration? Answer: Section 59 of the Act provides for declaration of an undisclosed asset and not income. In this case the Bank account is an undisclosed asset which may be declared. Tax on undisclosed asset is required to be paid on its fair market value. In case of a bank account the fair market value is the sum of all the deposits made in the account computed in accordance with Rule 3(1)(e). Therefore, tax and penalty needs to be paid on such fair market value and not on the balance as on date. Question No. 20: A person held a foreign bank account for a limited period between 1994-95 and 1997-98 which was unexplained. Since such account was closed in 1997-98 does he need to declare the same under Chapter VI of the Act? Answer: Section 59 of the Act provides that the declaration may be made of any undisclosed foreign asset which has been acquired from income which has not been charged to tax under the Income-tax Act. Since the investment in the bank account was unexplained and was from untaxed income the same may be declared under Chapter VI of the Act. The consequences of non-declaration may arise under the Act at any time in the future when the information of such account comes to the notice of the Assessing Officer. Question No.21: A person inherited a house property in 2003-04 from his father who is no more. Such property was acquired from unexplained sources of investment. The property was sold by the person in 2011-12. Does he need to declare such property under Chapter VI of the Act and if yes then, what will be the fair market value of such property for the purpose of declaration? Answer: Since the property was from unexplained sources of investment the same may be declared under Chapter VI of the Act. However, the declaration in this case needs be made by the person who inherited the property in the capacity of legal representative of his father. The fair market value of the property in his case shall be higher of its cost of acquisition and the sale price as per Rule 3(2) of the Rules. Question No.22: A person acquired a house property in a foreign country during the year 2000-01 from unexplained sources of income. The property was sold in 2007-08 and the proceeds were deposited in a foreign bank account. Does he need to declare both the assets under Chapter VI of the Act and pay tax on both the assets? Answer: The declaration may be made in respect of both the house property and the bank account at their fair market value. The fair market value of the house property shall be higher of its cost and the sale price, less amount deposited in bank account. If the cost price of the house property is higher the declarant will be required to pay tax and penalty on (cost price – sale price) of the house. If the sale price of the house property is higher the fair market value of the house property shall be nil as full amount was deposited in the bank account. The fair market value of the bank account shall be as determined under Rule 3(1)(e) and tax and penalty shall be paid on this amount. (Please also refer to the illustration under Rule 3(3) for computation of fair market value.) Further, it is advisable to declare all the undisclosed foreign assets even if the fair market value as computed in accordance with Rule 3 comes to nil. This may avoid initiation of any inquiry under the Act in the future in case such asset comes to the notice of the Assessing Officer. Question No.23: A person is a non-resident. However, he was a resident of India earlier and had acquired foreign assets out of income chargeable to tax in India which was not declared in the return of income or no return was filed in respect of that income. Can that person file a declaration under Chapter VI of the Act? Answer: Section 59 provides that a declaration may be made by any person of an undisclosed foreign asset acquired from income chargeable to tax under the Income-tax Act for any assessment year prior to assessment year 2016-17. Since the person was a resident in the year in which he had acquired foreign assets (which were undisclosed) out of income chargeable to tax in India, he is eligible to file a declaration under section 59 in respect of those assets under Chapter VI of the Act. Question No.24: A person is a resident now. However, he was a non-resident earlier when he had acquired foreign assets (which he continues to hold now) out of income which was not chargeable to tax in India. Does the person need to file a declaration in respect of those assets under Chapter VI of the Act? Answer: No. Those assets do not fall under the definition of undisclosed assets nder the Act. Question No. 25: If a person has 3 undisclosed foreign assets and declares only 2 of those under Chapter VI of the Act, then will he get immunity from th Act in respect of the 2 assets declared? the third asset which is not declared. Question No. 26: A resident earned income outside India which has been deposited in his foreign bank account. The income was charged to tax in the foreign country when it was earned but the same was not declared in the return of income in India and consequently not taxed in India. Does he need to disclose such income under Chapter VI of the Act? Will he get credit of foreign tax paid? Answer: Declaration under Chapter VI is to be made of an undisclosed foreign asset. In this case, the person being a resident of India, the foreign bank account needs to be declared under Chapter VI as it is an undisclosed asset and acquired from income chargeable to tax in India. The fair market value of the bank account shall be determined as per Rule 3(1)(e). No credit of foreign taxes paid shall be allowable in India as section 84 of the Act does not provide for application of sections 90(1)(a)/90(1)(b)/ 90A(1)(a)/ 90A(1)(b) of the Income-tax Act (relating to credit of foreign tax paid) to the Act. Further, section 73 of the Act does not allow agreement with foreign country for the purpose of granting relief in respect of tax chargeable under the Act. Question No. 27: Can a person declare under Chapter VI his undisclosed foreign assets which have been acquired from money earned through corruption? Answer: No. As per section 71(b) of the Act, Chapter VI shall not apply, inter- alia, in relation to prosecution of any offence punishable under the Prevention of Corruption Act, 1988. Therefore, declaration of such asset cannot be made under Chapter VI. However, if such a declaration is made and in an event it is found that the asset represented money earned through corruption it would amount to misrepresentation of facts and the declaration shall be void under section 68 of the Act. If a declaration is held as void, the provisions of the Act shall apply in respect of such asset as they apply in relation to any other undisclosed foreign asset. Question No. 28: If a foreign asset has been acquired partly out of undisclosed income chargeable to tax and partly out of disclosed income/exempt income (tax paid income) then whether that foreign asset will be treated as undisclosed? Whether declaration under Chapter VI needs to be made in respect of such asset? If yes, what amount should be disclosed? Answer: As per section 5 of the Act, in computing the value of an undisclosed foreign asset any income which has been assessed to tax under the Income-tax Act from which that asset is acquired shall be reduced from the value of the undisclosed foreign asset. Only part of the investment is such foreign asset is undisclosed (unexplained) hence declaration of such foreign asset may be made under Chapter VI of the Act. The amount of declaration shall be the fair market value of such asset as on 1st July, 2015 as reduced by the amount computed in accordance with section 5 of the Act. Question No. 29: Whether for the purpose of declaration, the undisclosed foreign asset should be held by the declarant on the date of declaration? Answer: No, there is no such requirement. The declaration may be made if the foreign asset was acquired out of undisclosed income even if the same has been disposed off and is not held by the declarant on the date of declaration. Question No. 30: Whether at the time of declaration under Chapter VI, will the Principal Commissioner/Commissioner do any enquiry in respect of the declaration made? Answer: After the declaration is made the Principal Commissioner/Commissioner will enquire whether any information has been received by the competent authority in respect of the asset declared. Apart from this no other enquiry will be conducted by him at the time of declaration. Question No. 31: A person is a beneficiary in a foreign asset. Is he eligible for declaration under section 59 of the Act? individual who derives benefit from the asset during the previous year and the consideration for such asset has been provided by any person other than such beneficiary. Therefore, as per the Act the beneficial owner is eligible for declaration under section 59 of the Act. Question No. 32: A person was employed in a foreign country where he acquired or made an asset out of income earned in that country. Whether such asset is required to be declared under Chapter VI of the Act? Answer: If the person, while he was a non-resident in India, acquired or made foreign asset out of income which is not chargeable to tax in India, such asset shall not be an undisclosed asset under the Act. Online return filing for NRIs and foreign nationals. Get guidance on DTAA and foreign assets. File your income tax return easily.